The thrilling third edition of TriStar Monaco takes place tomorrow in the heart of the Principality of Monaco. His Serene Highness Prince Albert II, Prince of Monaco is going to give start of TriStar111 Monaco tomorrow at the Larvotto Beach. Around 800 athletes are racing this fun format of the triathlon, TriStar111 (1km swimming, 100km cycling and 10km running) in the breath-taking hinterland of the Côte d'Azur region and the world-famous Formula 1 Circuit passing through Monaco. 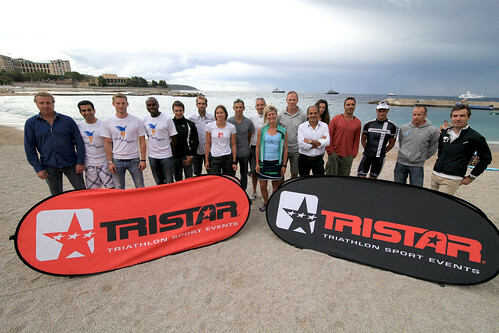 Celebrities, VIPs, Professional Triathletes and Age Groupers got their personal Pole Position in the TriStar111 Monaco, either as individual starters or as members of a Relay Team. A strong PRO field guarantees a great show. Reigning champion Johannes Moldan from Germany comes back to Monte Carlo to defend his title. But French François Chabaud, Italian Alberto Casadei (winner of TriStar Salzkammergut), Olivier Marceau (winner in Monaco two years ago) or Rodolphe Von Berg Jr (second in 2011) will try to take the victory. There will be also many other top contenders fighting for the triumph in the Formula 1 of Triathlon: Austrian Andi Fuchs, Italian Domenico Passuello, or French triathletes Romain Cadiere and Nicolas Lebrun. There will be a nice female race as well with triathletes such as Adeline Rausis, Lisa Hütthaler and Tine Holst. Some famous sportsmen from other disciplines and celebrities will have a go tomorrow: drivers Lucas Di Grassi, Maro Engel or Gilles Panizzi, cyclists Christophe Agnolutto and Geoffroy Lequatre, former French rugby players Sébastian Viars and Stéphane Ougier and celebrities such as Paul Belmondo or Marc Toesca. Paul Belmondo: “I’m aimming to enjoy the race and to try to improve my last year result here. I love triathlon and I’m really having fun racing TriStar events. It’s going to be again a great experience, looking forward to performance a nice bike ride and to push hard my pace in the streets of Monaco. TriStar takes care of everything and sets up high quality events, thus we only need to focus on the competition." Marc Toesca: “Triathlon for me it’s a real challenge. Tomorrow will be my first full TriStar111 –I did it last year as a member of a Team Relay and also completed TriStar55.5 Cannes. I have been one of the pioneer of the Triathlon in France, I raced one of the first races ever in France in 1983 in Nice. So when I saw that there was a Triathlon passing under my balcony I realized that it was a matter of time for me to compete again!”. The 1km swim takes place in the Larvotto Bay, just off the Larvotto Beach in the Southeast of the Principality. The 100km bike leg will take athletes out of Monaco heading to Roquebrune and up the steep mountains of the hinterland. Breath-taking views and picturesque villages of the bike ride have always been the centrepiece of the triathlon in Monaco, and TriStar111 Monaco will take athletes to the most stunning places. The 10km run will be accomplished in two and a half loops on the world famous Formula 1 circuit featuring the Tunnel, the Port, the Gardens of the Casino and the hairpin bend. 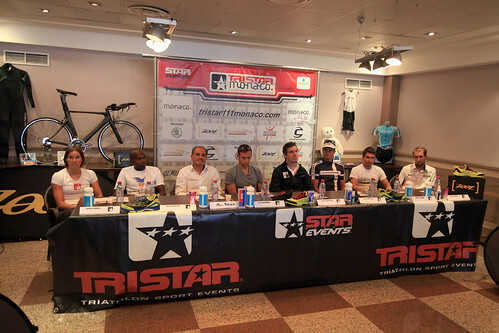 Please visit www.tristar111monaco.com for more information and www.tristarlive.com for live coverage. Retrouvez les photos de TriStar Monaco en direct ! Live TriStar Monaco from the inside! Feel the TriStar atmosphere and have a look on our Facebook page HERE!